In November, a report from the United Nation’s Intergovernmental Panel on Climate Change grimly projected that if we do not turn around our emissions trends within the next dozen years, we are dooming ourselves to irreparable climate change. Thursday, Rep. Alexandria Ocasio-Cortez addressed this impending catastrophe with the Green New Deal resolution, as per The Hill. Her resolution in the House is complemented by Sen. Ed Markey’s (D—Mass.) proposal in the Senate. 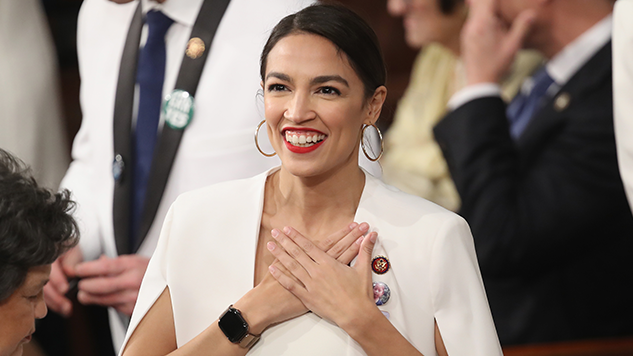 Titled “Recognizing the duty of the Federal Government to create a Green New Deal,” the resolution aims to reach a goal of net-zero greenhouse gas emissions and, in the process, create millions of jobs. It also calls on the U.S. to take responsibility for its role in accelerating the emission of greenhouse gases. Since before the beginning of her term, Ocasio-Cortez has been pushing for Democrats to prioritize climate change in their legislative efforts. The N.Y. representative joined the youth-driven Sunrise Movement in a sit-in at Speaker Nancy Pelosi’s office, advocating a climate change-focused agenda. She proposed a special committee on the subject, which was dismissed by party leaders. Finally, though, this resolution promises to force those in top U.S. legislative positions to confront the dire future ahead of us in substantive ways.
.@AOC is on NPR talking about funding the Green New Deal by decoupling tax revenue from government spending. Heads are exploding across Washington. Even the solutions that we have considered big and bold are nowhere near the scale of the actual problem that climate change presents to us to our country, to the world. And so while carbon taxes are nice while things like cap and trade are nice, it’s not what’s going to save the planet. It could be part of a larger solution but no one has actually scoped out what that larger solution would entail. And so that’s really what we’re trying to accomplish. This is really about providing justice for communities and just transitions for communities. So really the heart of the Green New Deal is about social justice and it’s about allowing and fighting for things like fully-funded pensions for coal miners in West Virginia, fighting for clean water in Flint, and fighting for the ability of indigenous peoples to take a leadership role in in where we’re moving as a country. The Green New Deal has proven popular with many 2020 Democratic candidates, indicating that serious action on climate change will likely be a main issue during this race. Sens. Kirsten Gillibrand (D—N.Y. ), Cory Booker (D—N.J. ), Elizabeth Warren (D—Mass. ), and Kamala Harris (D—Calif.) will co-sponsor the resolution, according to The Washington Post. The proposal also received support from Sen. Bernie Sanders (I—Vt. ), who has yet to officially announce whether he’s running. Reps. Ro Khanna (D—Calif. ), Joe Neguse (D—Colo. ), Pramila Jayapal (D—Wash.) and Mark Pocan (D—Wis.) are co-sponsoring the resolution in the House. As expected, conservatives aren’t exactly thrilled by the Green New Deal, including Rep. John Shimkus (R—Ill.). They must have a secret off-planet base that we don’t know about for when this all goes to hell.